Daniel W Birch, MSc MD FCRCS FACS, Shahzeer Karmali, MD FRCSC, Nader W Azer, MD. Centre for Advancement of Minimally Invasive Surgery, Department of Surgery, Division of General Surgery, University of Alberta, Edmonton, Alberta, Canada. Angelchik prosthetic rings have been used for the surgical treatment of gastroesophageal reflux disease (GERD) since 1973. They were first described by Jean-Pierre Angelchik, in 1979. It is estimated that more than 30,000 Angelchik rings had been implanted in patients worldwide before the high complication rate discourage further use. The doughnut-like-shaped prosthesis is made of an elastomer shell filled with a silicone gel. A radiopaque silicone marking strap allows for closure of the ring around the esophagus and later radiographic localization. The prothesis weighs about 45 gram; it has an inner diameter of 2.5–3.1 cm and an outside diameter of 6–7 cm. The implantation procedure was intended to be shorter in duration and to rely less upon suturing of serosal layers than other surgical procedures, such as fundoplication and posterior gastropexy. The main advantage was the ease of insertion with low morbidity and short hospital stay. Its efficacy by 24-hour pH-metry and/or manometry was confirmed in several studies that suggested that the Angelchik ring provides early postoperative control. However, re-operation for removal of Angelchik rings due to dysphagia has been necessary in 5–15% of patients. Dysphagia has been the most common complication after implantation of the Angelchik prosthesis. It ranges from self-limited postoperative dysphagia to chronic intermittent or progressive dysphagia. The mechanism of dysphagia is thought to be fixation of the prosthesis too tightly around the esophagus resulting in outflow obstruction. In addition, a dense fibrotic capsule has been described surrounding implanted prostheses that had to be removed; this also may contribute to dysphagia. Other complications reported are disruption, migration, erosion, pericapsular fibrosis,failure to control gastro-esophageal reflux, gas bloat syndrome, rotation, and downward slippage of the prosthesis. We recently removed an Angelchik prosthesis laparoscopically in an 47-year-old man with progressive, refractory dysphagia due to an Angelchik ring originally placed in 1984 at open operation. An extensive adhesiolysis was performed laparoscopically, and the Angelchik ring was dissected free from the proximal stomach, diaphragm, and liver. The fibrous pseudocapsule enclosing the ring was divided, and the prosthesis was removed from around the esophagus. Intraoperative upper endoscopy was performed and there was no evidence of bubbling or leakage. There were no intraoperative complications, and the single contrast stomach and duodenum performed on the 1st post operative day demonstrated no evidence of contrast extravasation, the esophagus appeared within normal limits. The patient was discharged home on the 2rd postoperative day tolerating a regular diet. Postoperatively, he experienced resolution of his dysphagia. 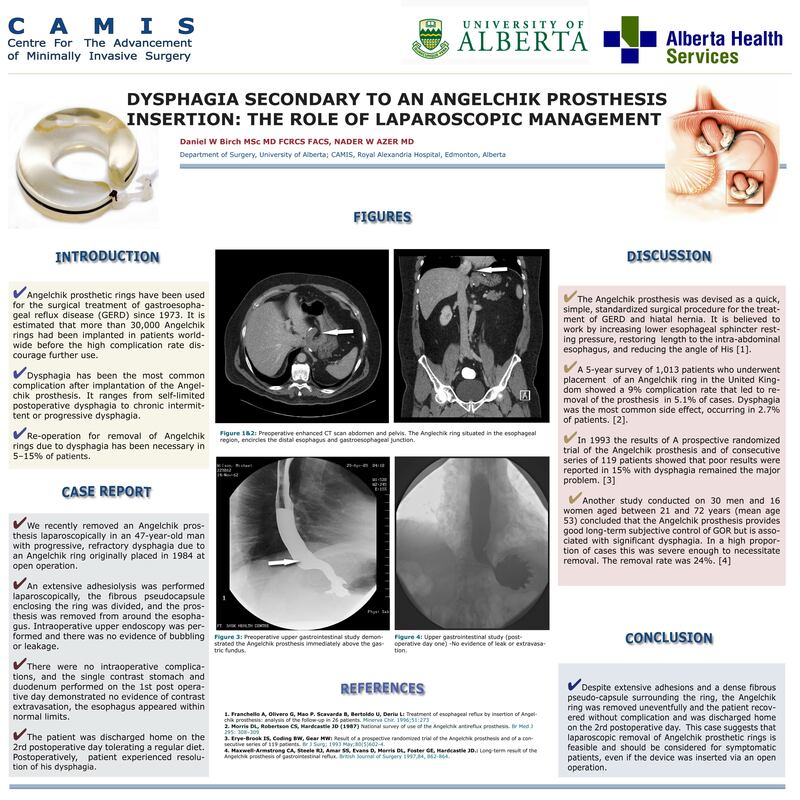 This case suggests that laparoscopic removal of Angelchik prosthetic rings could be performed by surgeons familiar with the procedures of the esophageal hiatus and should be considered for symptomatic patients.